There is a big difference between a justification and an excuse. In a non-compete case, many times an employee - being in a position of having to admit breach - offers only a litany of excuses, rather than a legal justification. Such was the case in a summary judgment decision involving a claim against a sales agent for a chemical products distribution company. The ex-employee, Mahoney, sold commercial grade chemicals to large customers - and only a couple of dozen, at that - on behalf of Drummond American. She signed a two-year customer non-compete clause, barring her from soliciting sales of competing products relating to accounts she serviced at Drummond. Drummond had to admit a breach - despite her new employer's admonition against violating the non-compete contract, she sold chemical products to 12 of her 26 former Drummond accounts. 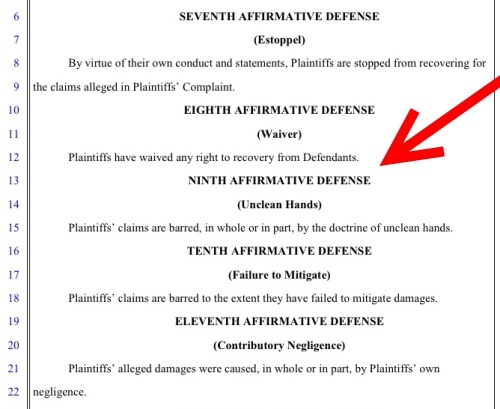 In defense, Mahoney offered an array of excuses for her breach, it being generally acknowledged that the covenant was reasonable under Connecticut law. 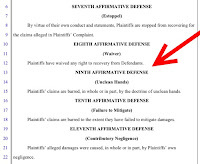 The court rejected, rather easily, each defense. Of particular note was Mahoney's contention that the doctrine of unclean hands applied to her argument that Drummond hired employees from competitors and encouraged them to violate non-compete contracts. This "defense", if one can call it that, is one I see frequently. However, it is irrelevant, at best. Even assuming the defense is true, no two employees are alike. One employee may have little value to an ex-employer (perhaps she was an underperformer), so the cost of litigating almost certainly would outweigh any benefit from obtaining an injunction. The company from whom another employee is hired may be exiting the market entirely and not likely to pursue a claim. There really are an unlimited number of reasons. But the doctrine of unclean hands requires a showing that the plaintiff acted inequitably as to the particular controversy at issue. Airing your ex-employer's dirty linens in an unrelated matter not only is a poor defense, it generally shows the court the employee can offer nothing more than flimsy excuses for a contract breach.